This casserole recipe is filled with yummy vegetables, including corn, eggplant, carrots, celery and leeks. Add a little chili powder to spice it up! Sprinkle the drained quinoa on a baking sheet. Place it in the preheated oven for about 10 minutes, stirring occasionally, until golden brown. Set aside. Heat the ½ teaspoon of olive oil in a medium skillet and stir-fry the shallots, carrots, leeks and celery for 1 to 2 minutes. Set aside. Combine 1 cup of the corn and the soy milk into a blender and puree. Add the pureed mixture to the stir-fried vegetables along with the remaining corn and all but 2 tablespoons of the toasted quinoa and mix well. Spoon the mixture into a small loaf pan and sprinkle the remaining 2 tablespoons of toasted quinoa over the top. Bake, covered, in the preheated oven for 40 minutes. Uncover and bake for 20 more minutes. Remove from the oven while preparing the remaining vegetables. 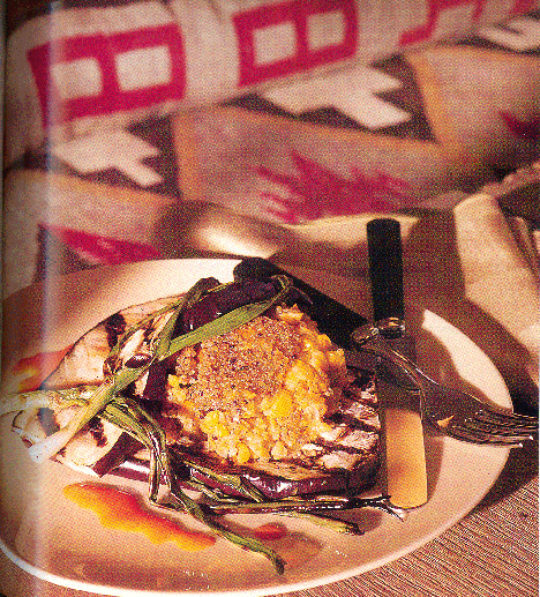 Brush the eggplant slices and scallions with the remaining 1 teaspoon of olive oil and arrange them in a roasting pan. Place in a hot oven for 8 to 10 minutes, or until browned. Place a slice of eggplant on each four plates. Divide the quinoa into 4 portions and spoon on top of the eggplant. Place the remaining eggplant slices on top. Garnish each serving with 1 tablespoon of chopped parsley and a pinch of chili powder. Place a scallion on top.